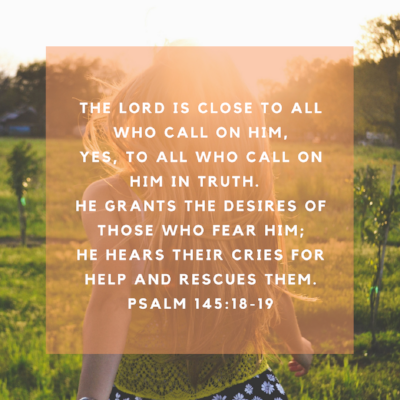 READ: Psalm 145:18-19 The Lord is close to all who call on him, yes, to all who call on him in truth. He grants the desires of those who fear him; he hears their cries for help and rescues them. Most days I just don't feel like anyone special. I have times where my strength seems small, periods of weariness, and discouragement. I'm a rather private person so I don't always voice this or even show it. I don't think I am alone in this. I have personal goals and dreams, even in my walk with Christ, and some days they just seem so far away. You know - no matter what we face, no matter how small and unimportant we feel at times - there is a GREAT BIG PROMISE in the scripture above! I am sharing with you (below) one of my favorite songs - listen to it & then CALL ON THE ONE WHO HAS THE POWER TO SAVE, HEAL, AND DELIVER YOU FROM ALL THINGS. Bless the Holy Name of JESUS!!! When I call on Jesus - ALL things are possible! Have a prayer request - I'd be HAPPY to pray for you!